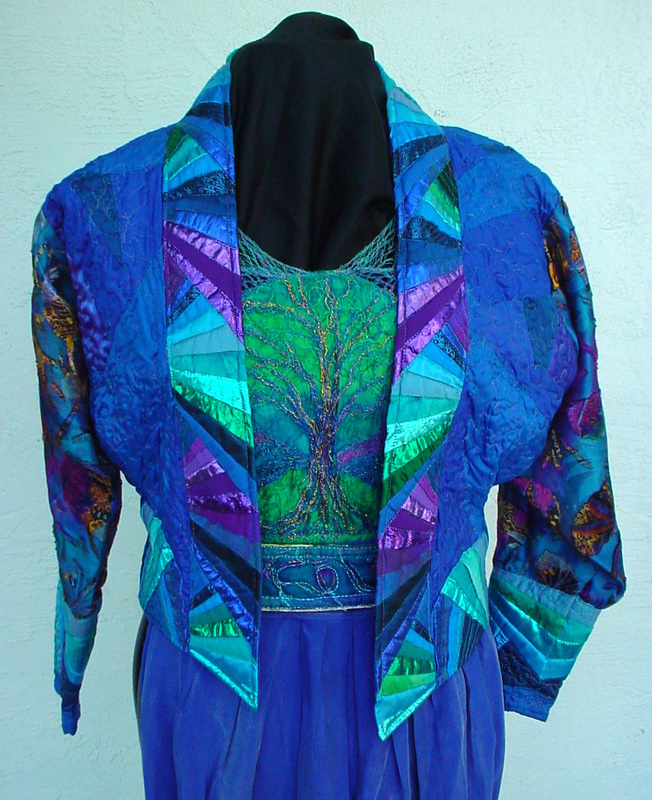 So, quilts aren't enough challenge for you? You want them to fit your three-dimensional body? What fun! 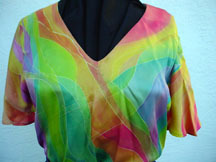 Here is a garment I call One Hot Mama, made with a lot of leftovers from my Filament Fantasy class. 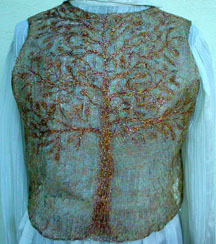 Below, there are a few pictures of some of my other garments. In the immortal words of Rachel Kincy Clark - "If you've got it, decorate it!" 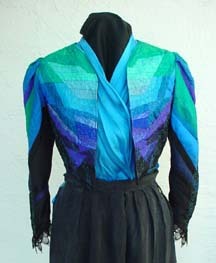 I was chosen as a Fairfield Designer twice, and a Bernina Designer twice. This was great fun because you could order anything you wanted for free, or just about. 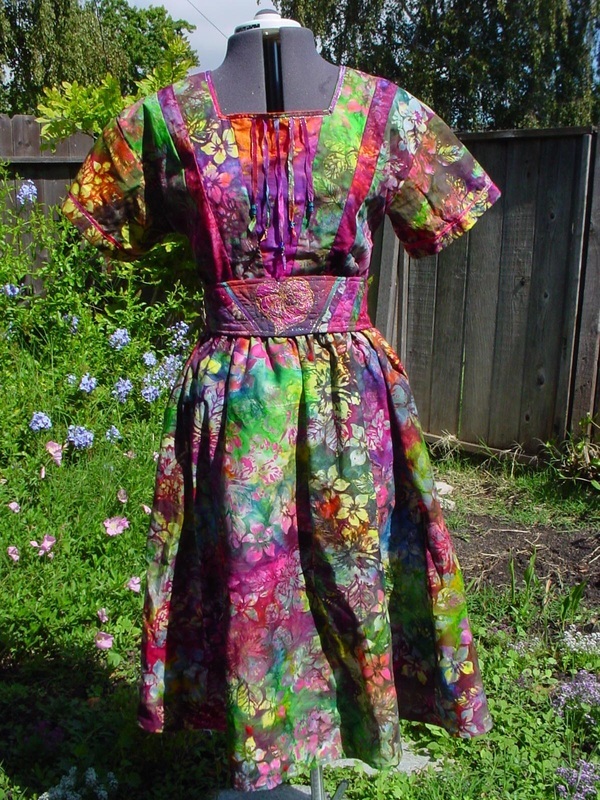 You did have to pay the wholesale cost for fabric and fusible crystals, but threads, notions, purse kits, Solvy, ribbons, elastic, patterns, and whatever else you wanted were free. 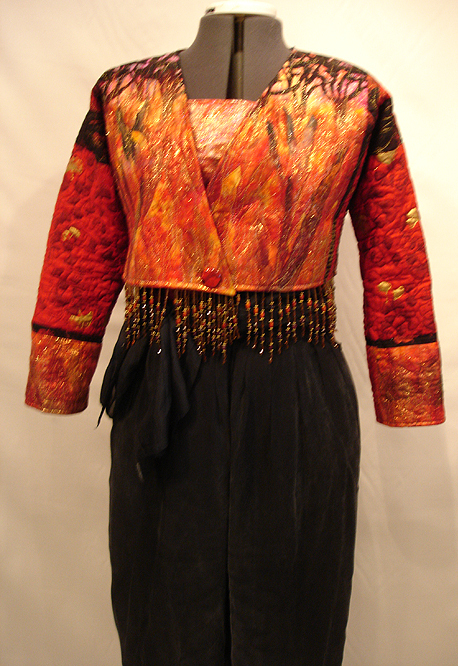 That is why we would spend 4 months working on our garments, then have a grand gala party, a super fashion show, and a book of the garments each time we did it. It was grand.......sigh. Here's to the old days! 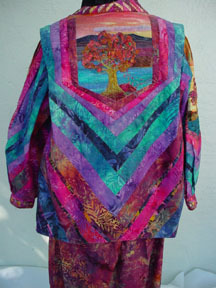 My first Fairfield garment for the Houston Quilt Show was called Wild Things in the Night Garden. 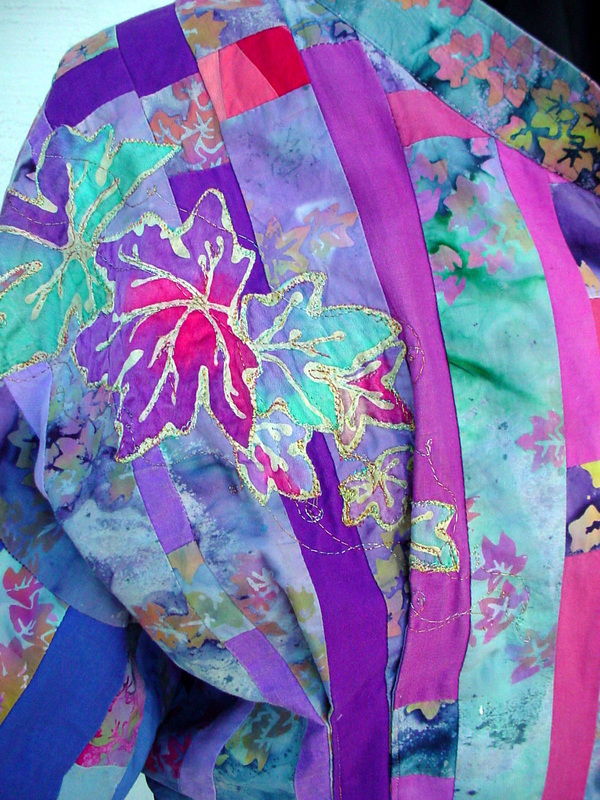 I used an Alexander Henry fabric with fanciful animals in the garden at the bottom of the coat, then made it into a whole scene, with flying gees up the lapel. 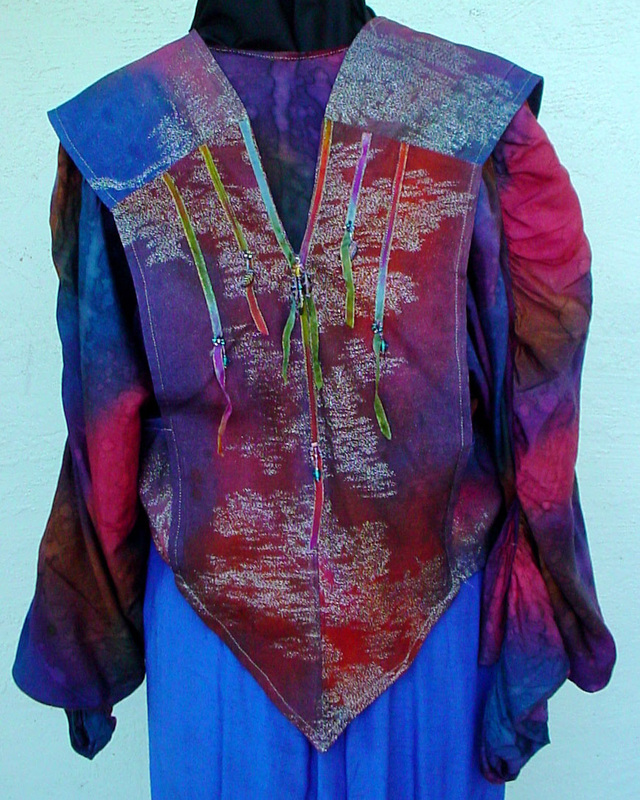 The smocked, beaded, sleeves took 3 months by themselves. 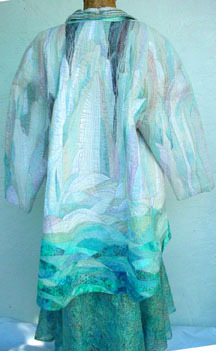 My second Fairfield garment was called Where the River Meets the Sea. 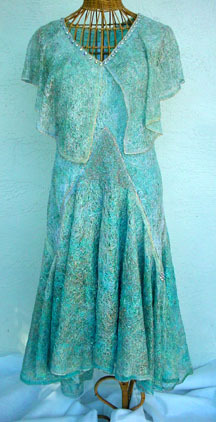 Since thread and Solvy were free, I made the dress completely out of thread - 18,000 yards of it, embellished with Schwarovsky crystals. 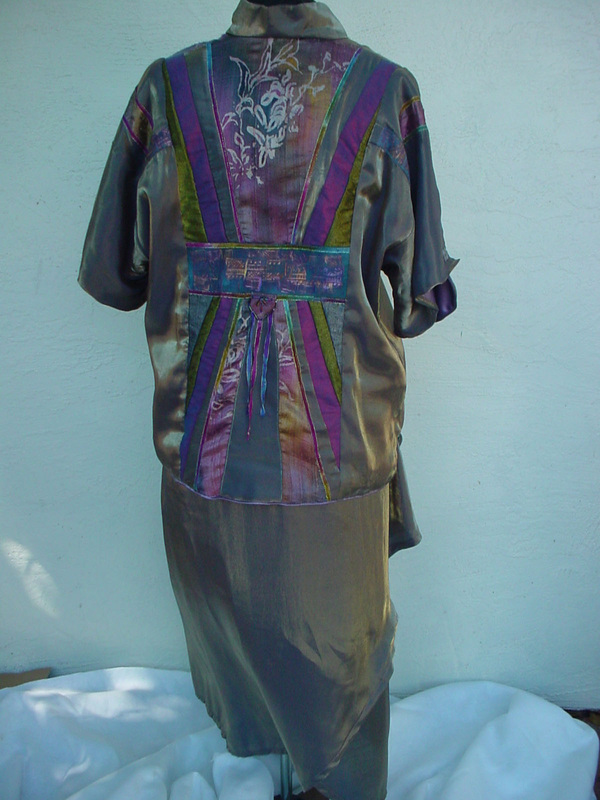 with a hand-dyed silk underdress. 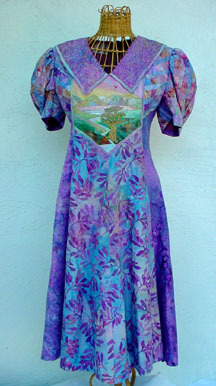 This is the first Bernina garment I made - called New Day Dawning. My husband finally got a real job after a year and a half of iffy contracting jobs, and I was so happy I had to make this sunrise dress. 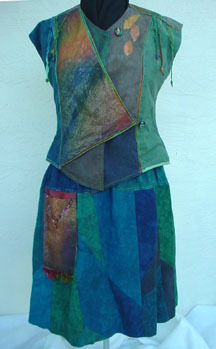 The top is made of ribbons and beads, the skirt is entirely made of thread, with my hand-dyed silk charmeuse underdress. 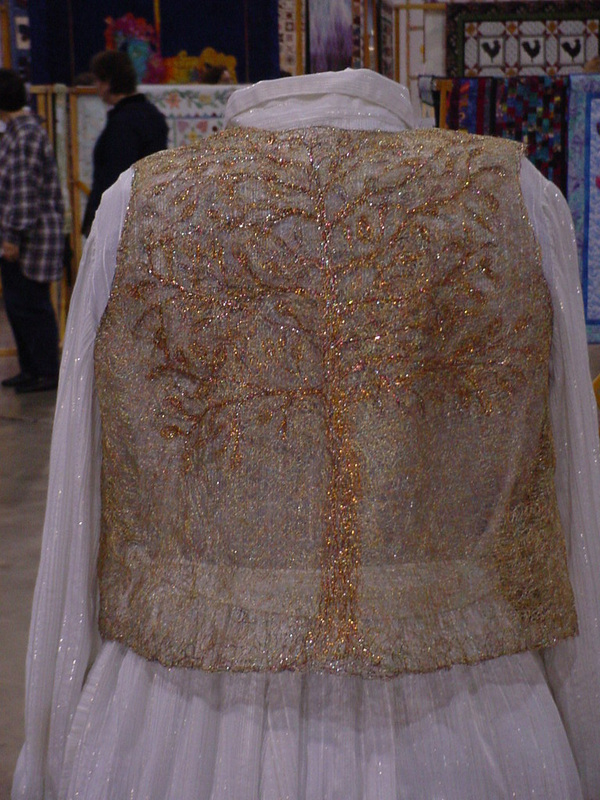 The coat for this garment is hand dyed Dupioni silk, with rows and rows of silver machine embroidery embellished with tiny crystal beads and hundreds of Schwarovski crystals. 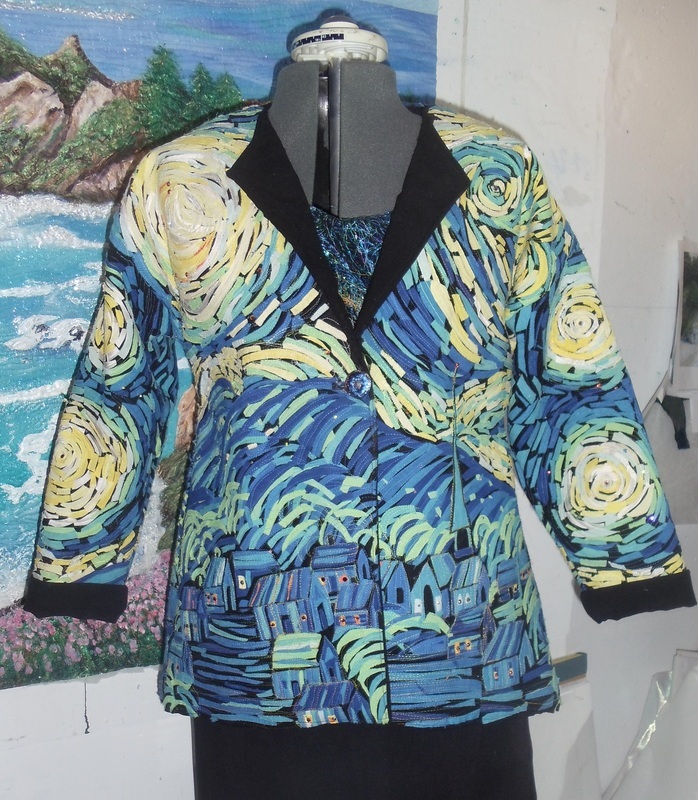 Starry Starry Night was the last Bernina garment I made. 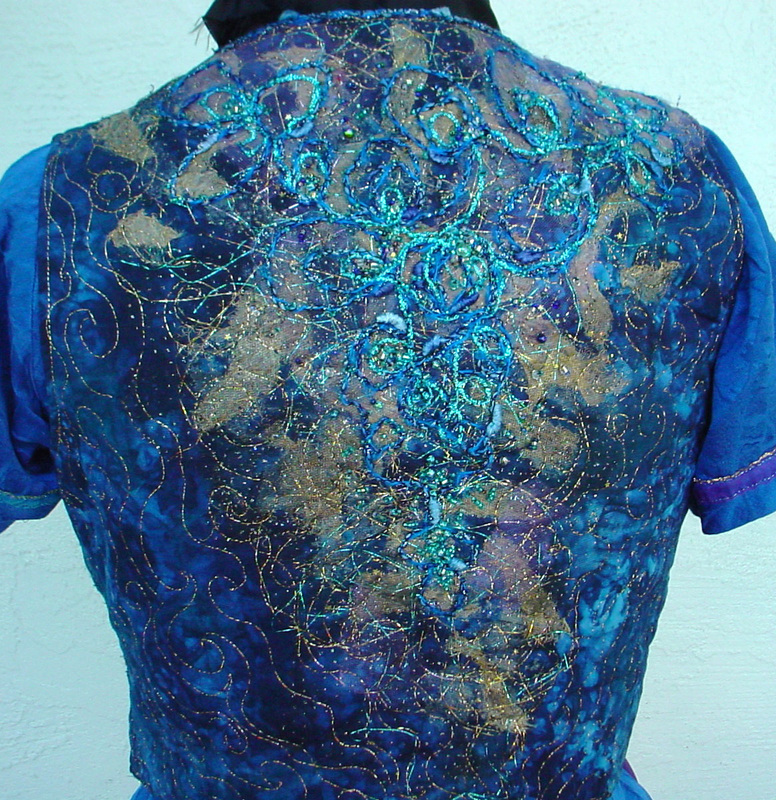 It is based on Van Gogh's famous painting, and is many thousands of bits of fabric and Schwarovsky crystals fused to black moleskin. 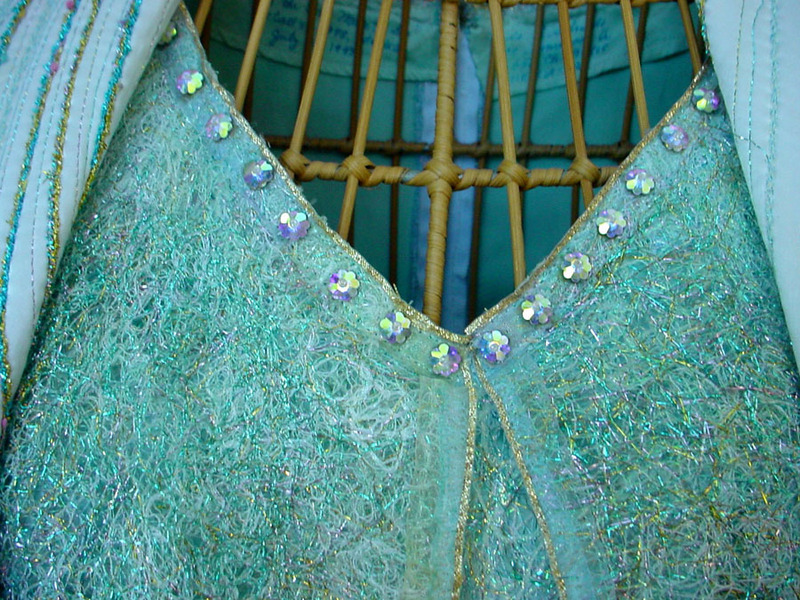 The blouse underneath is made of a base of black tulle, black Mistyfuse, then threads in the form of a galaxy, then another layer of tulle. 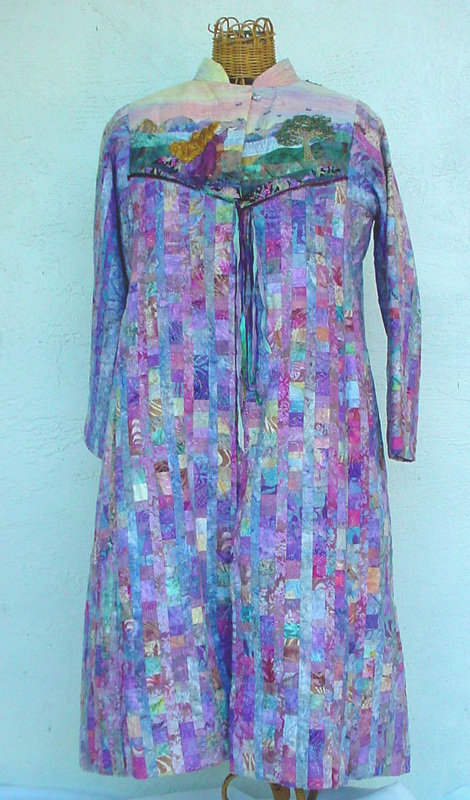 I sewed through it every 1/4" in a grid, then fused hundreds of crystals to it. 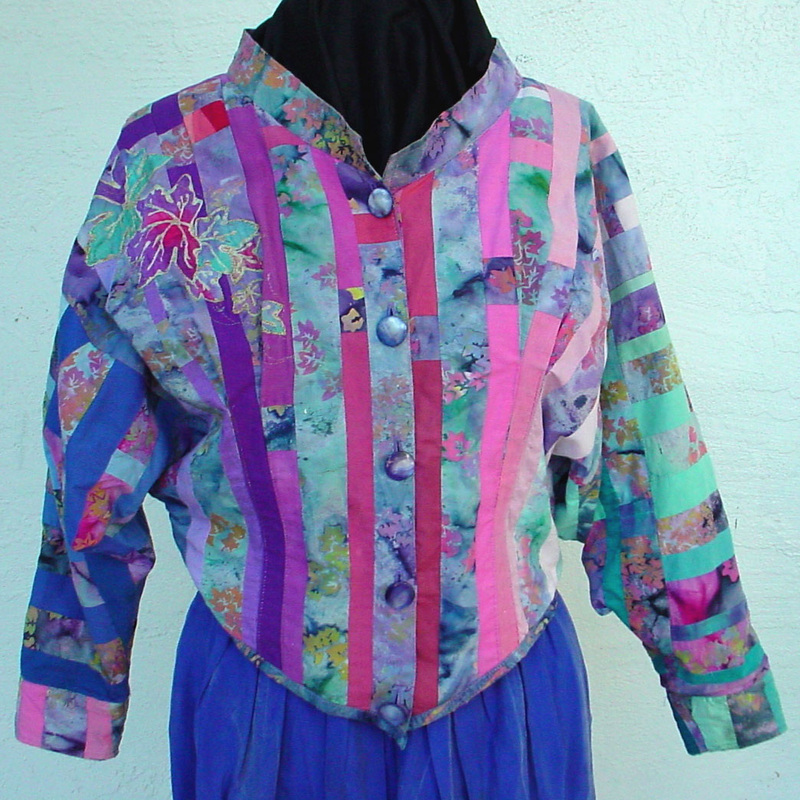 Blouse above, jacket in process below. 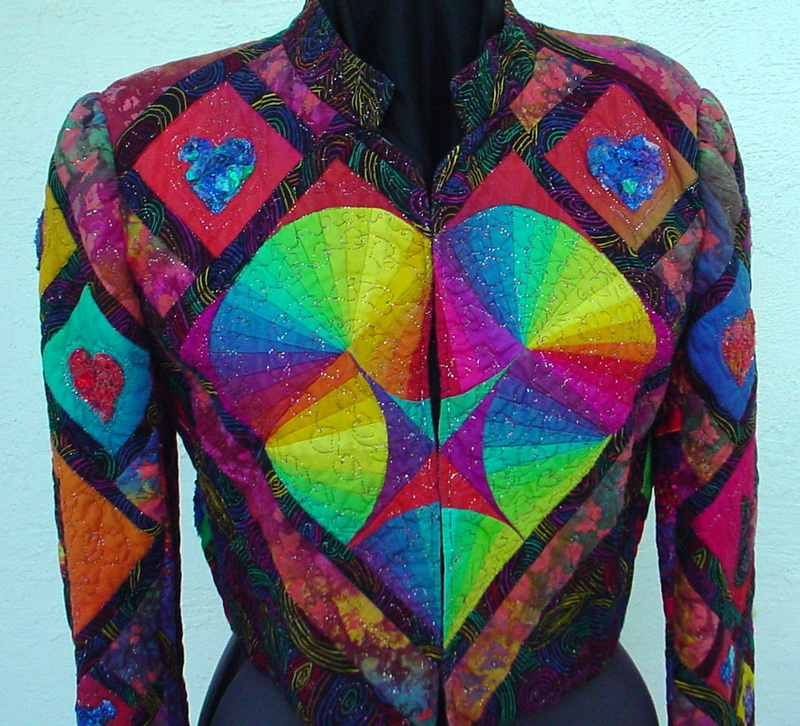 This is actually the second Hearts in Space jacket. 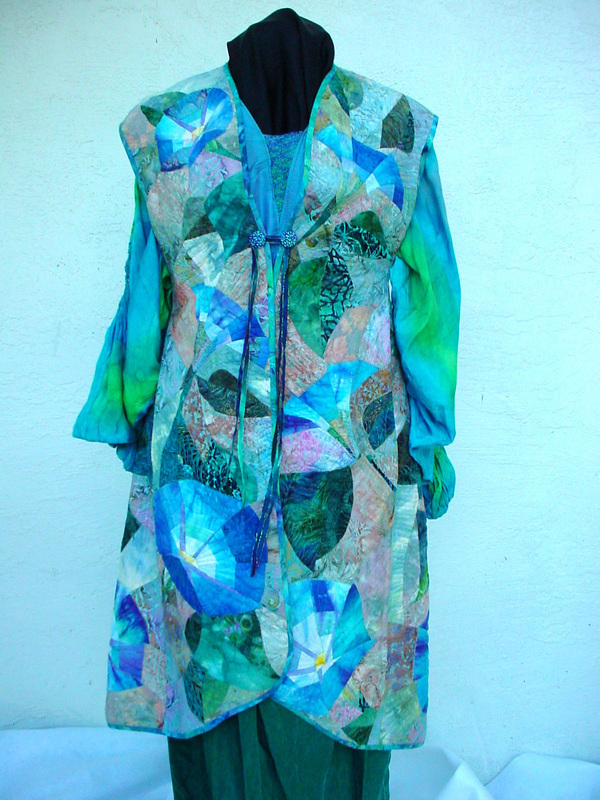 I leant (so I thought) this jacke to Lludmilla Bhokov for an exhibition, and then never got it back, so had to make a second jacket. 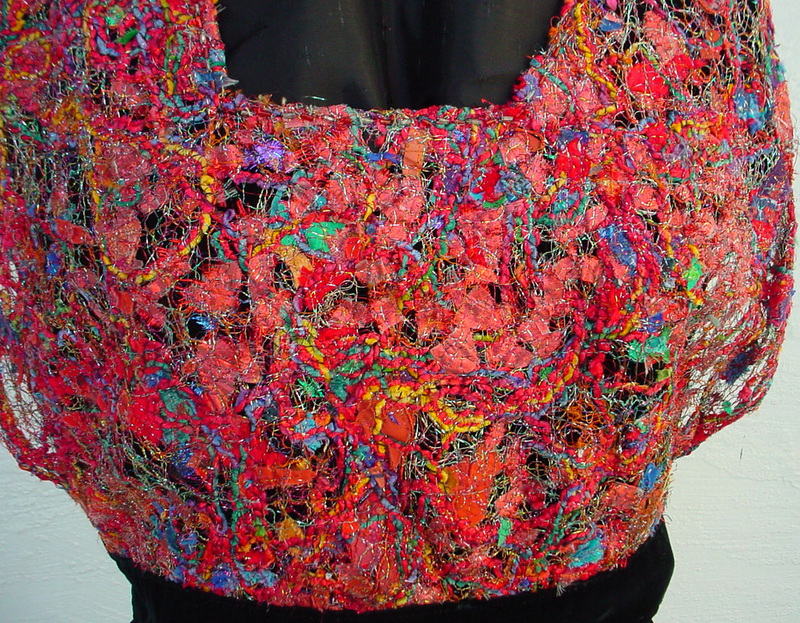 This was an exercsize in layering Bonding Agent 007, sheer fabrics, Angelina fibers, tulle, then fusing and adding twisted yarns and beading by hand. 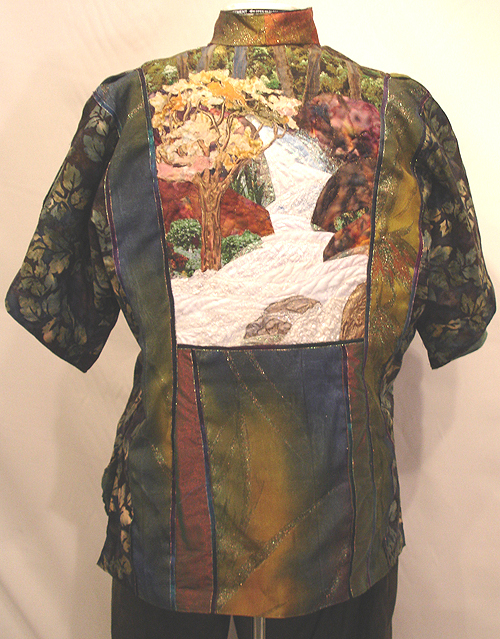 This is the front and back of Summer's Gone, an experiment with value gradations and painted silk appliques. 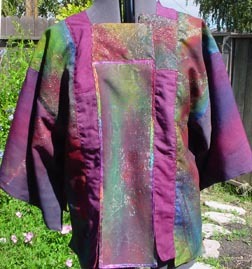 Jacket under Summer's Gone, made with scraps from a Caryl Bryer Fallert 3-day class in value gradations. 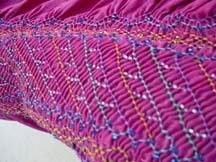 Dare to Dance! 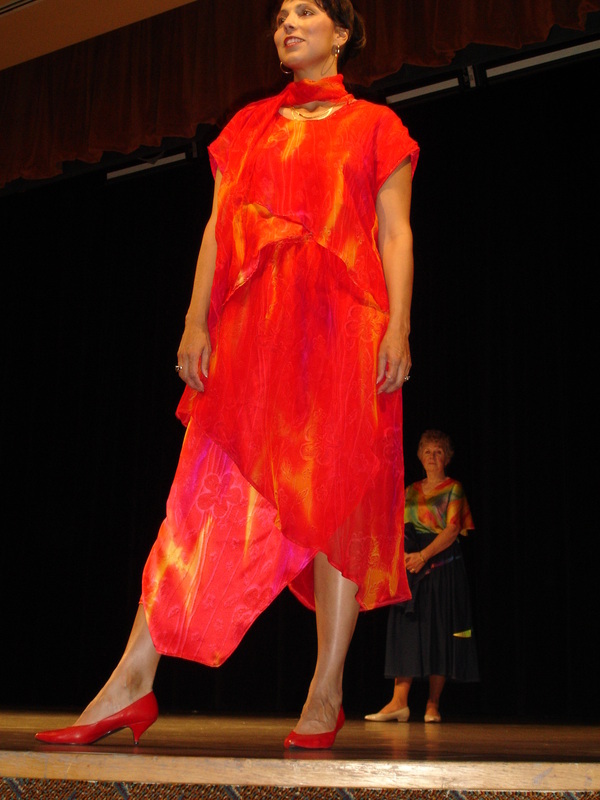 This garment has 27 feet around the hemline, just perfect for dancing! 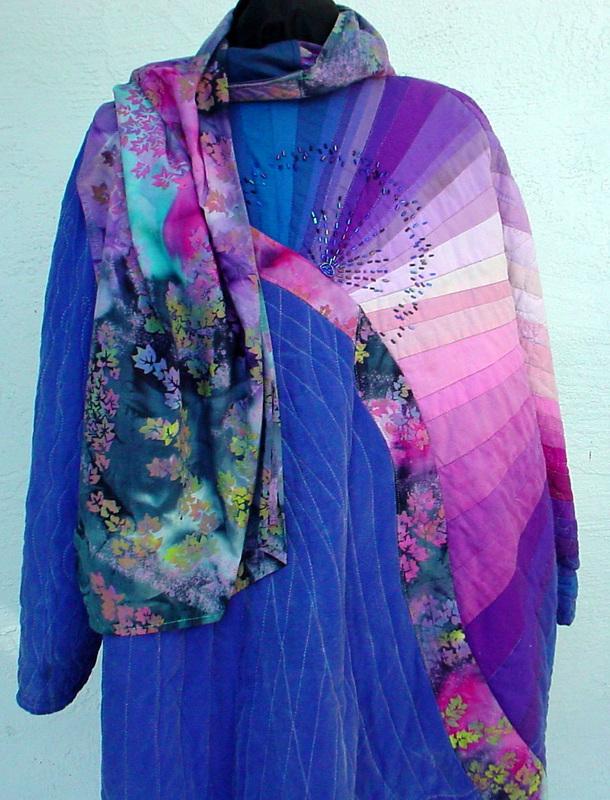 Oriental Dreams, using Diane Ericson's Peony Petal jacket pattern. 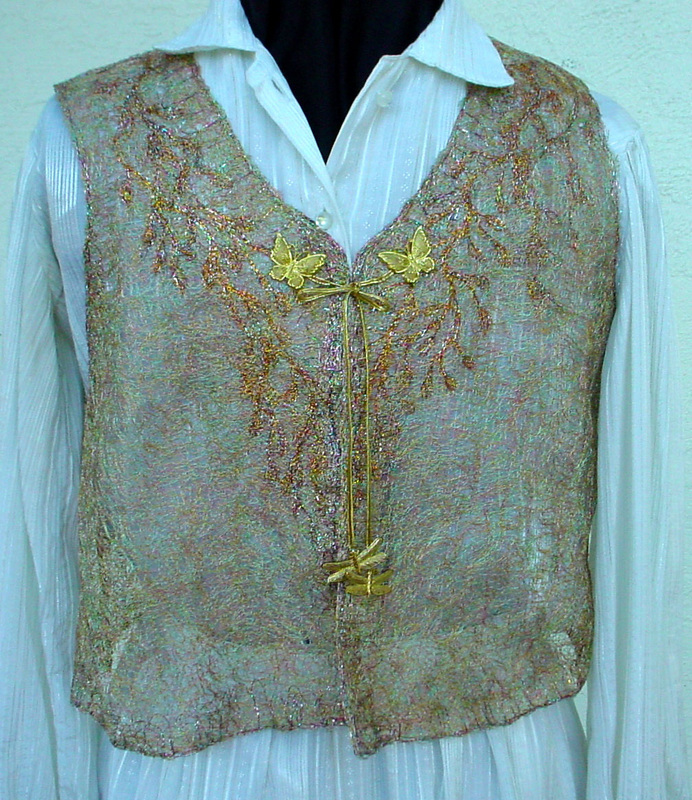 because I made the collar out of thread, just as the garment was made of thread. 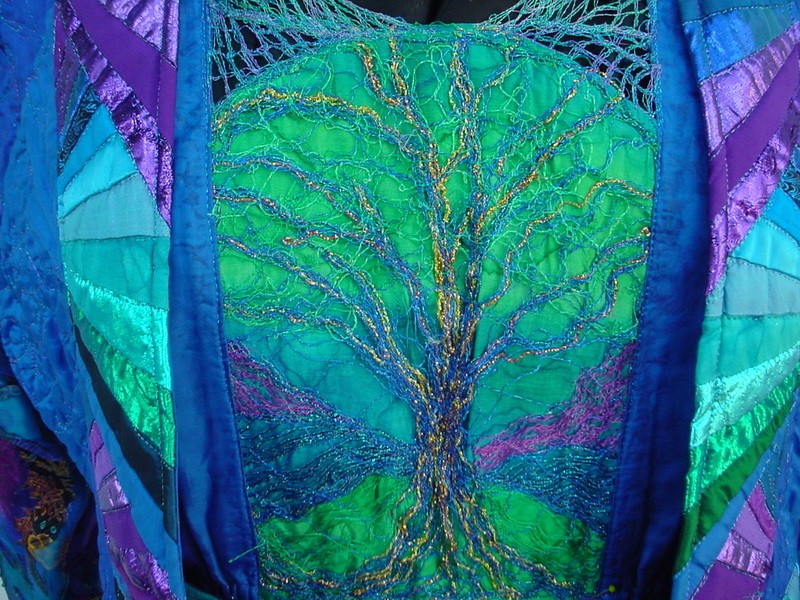 The tree was made separately on Solvy, then applqiued to the background silk. 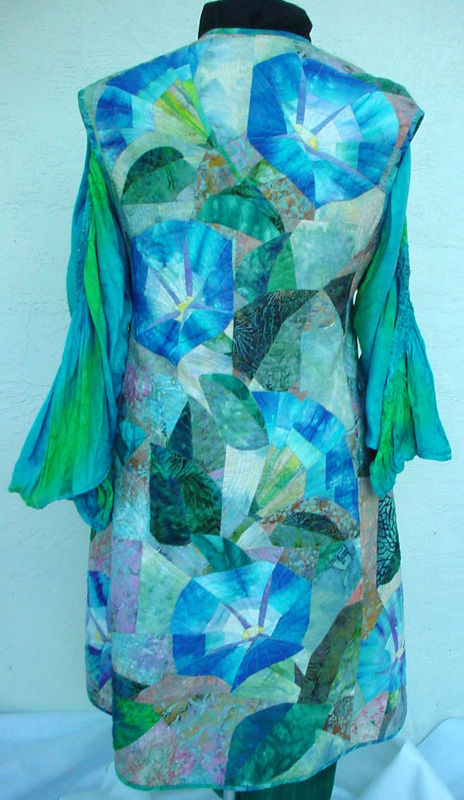 them to design my own, inimitable, pieced, morning glories. This was totally, extremely, decidedly, HARD! 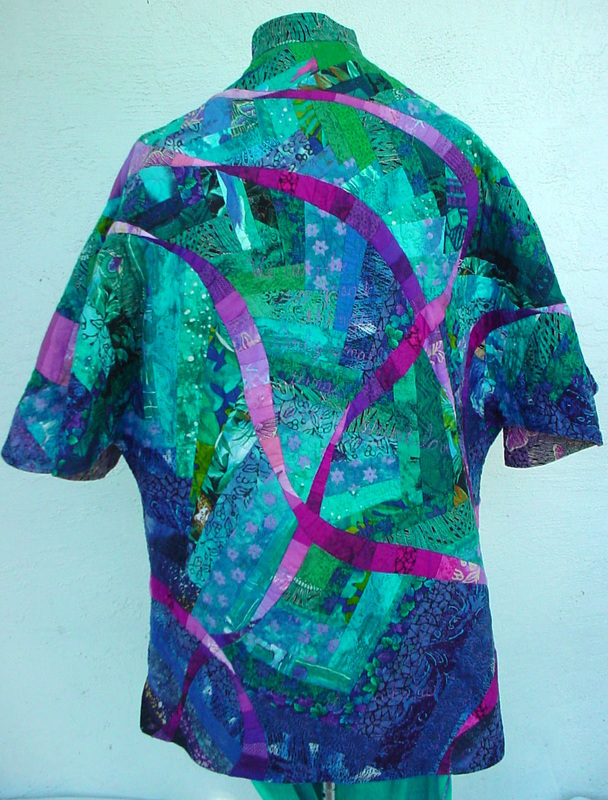 I made this after a Caryl Bryer Fallert class that had to do with gradations. 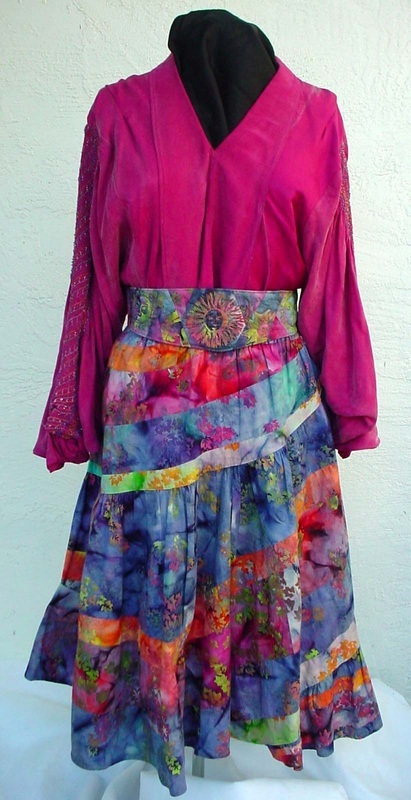 You had to bring 5 yards of 5 different colors, each yard a different gradation of a color. When the class was over, Caryl said she did not have enough room in her car to take the extra strips home, and did anybody want them? Yes, of course, I'll gladly take them off your hands! 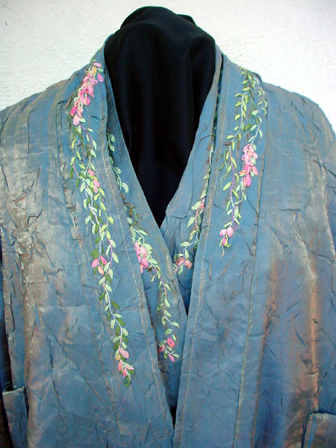 Pieced coat and jacket, with silk painted, appliqued leaves. Accepted into a Sulky thread challenge. Made on Solvy. 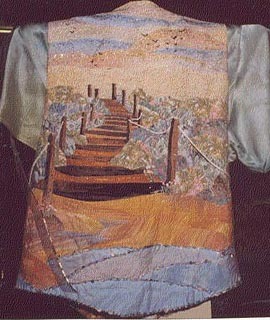 This is the front of Asilomar Sunrise vest. 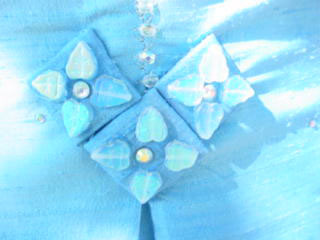 I think the $200 I got for getting both the Artist's Award and the Judge's award probably just about paid for the beads and embellishments. This is the staircase that leads from the sea to Asilomar, as seen from the beach. This is the back of Asilomar Sunrise. 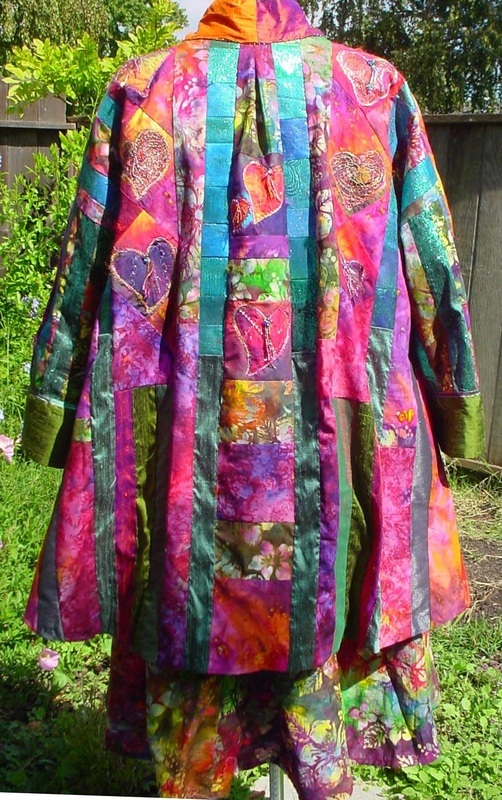 Hearts in Space - The front and back panels are foundation pieced, the other hearts are bits of stuff, sewn down with Solvy on top, then the Solvy was dissolved. 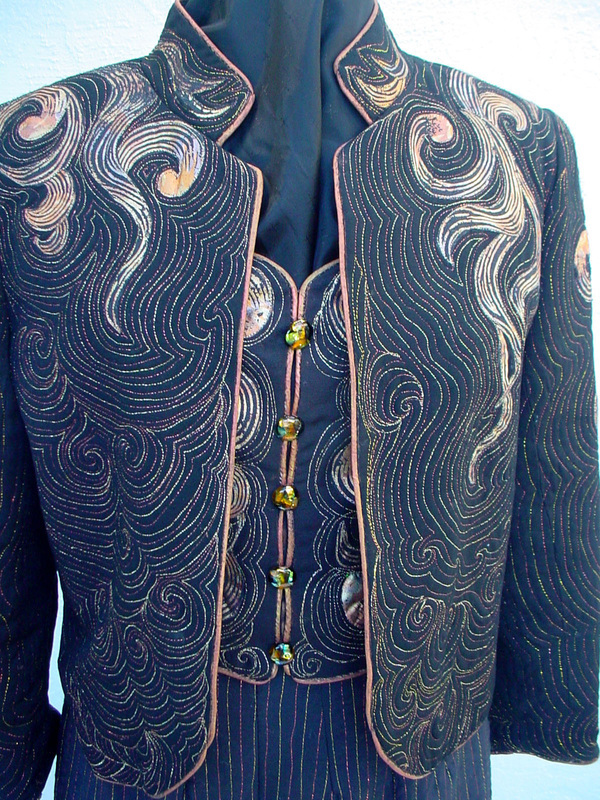 If you ever see Lludmilla Bhokov, tell her I want the original jacket back! 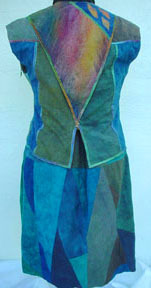 When she took the original one to Russia for an exhibit, she never sent it back, so I had to make a duplicate. The Music of the Night - a tribute to Phantom of the Opera. 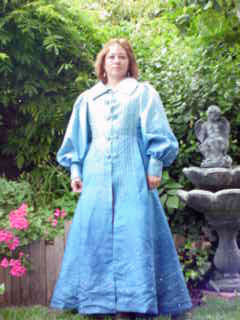 I figure that any show that costs $65/ticket deserves a new outfit. 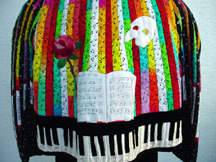 Back of Music of the Night, complete with an 88 key pieano keyboard made of silk charmeuse and black velvet. 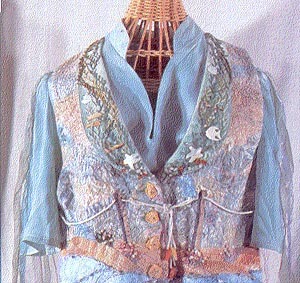 The blouse is made of tiny bits of fabric cut up, then ironed between two pieces of Solvy. 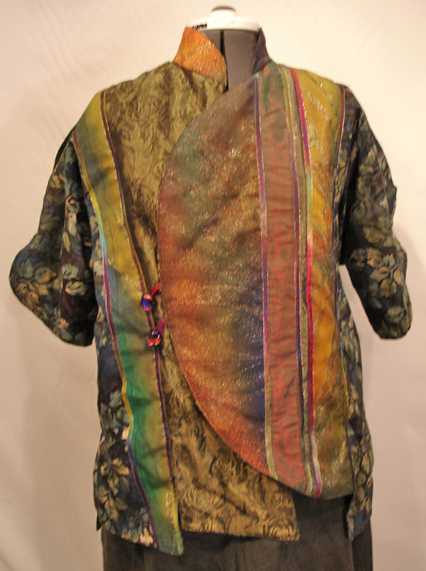 Then I sewed through that with a 1/4" grid, dissolved the Solvy, and laid it over black velvet to make the top. 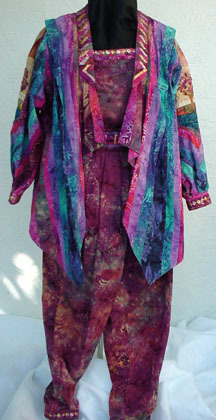 The skirt is a Le Skirt pattern, also of black velvet. 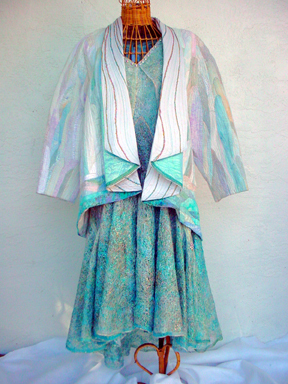 piecing in this outfit - in the lapel of the coat, the cuffs of the sleeves and pants, all around the neckline of the blouse and the short sleeves of the blouse. Fire! 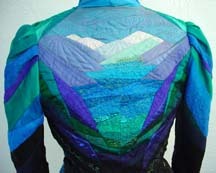 Jacket back. 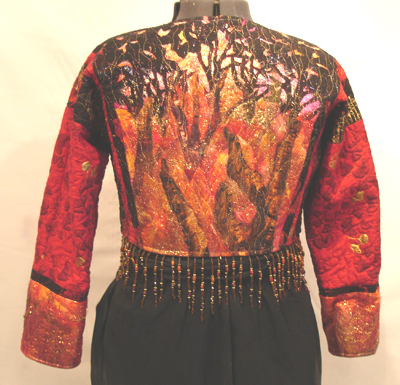 Made of many layers of fabric painting, Tintzl, fused fabric flames, Bonding Agent 007, ripped up sheer fabrics, burnt edge trees, a layer of tulle and more Bonding Agent 007. Very, very, HOT! 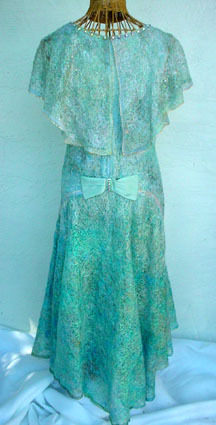 Bonding Agent 007, bits of sheers, Tintzl andAngelina fibers, melted painted gold cellophane, tulle, and more Bonding Agent 007. 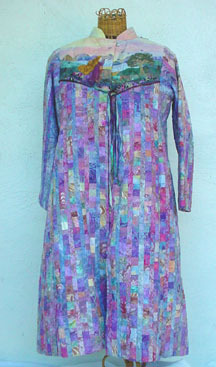 Then, on top of all of that is hand couched yarns in stitchery patterns, and many, many beads. In the class, I got a piece about 5" in radius done. 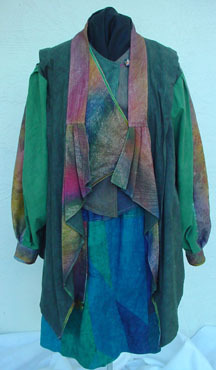 This jacket is pieced, not appliqued, and is in what we Minnesotans call "Earth Tones."